Welcome to another installment of the Get Ready Mailbag, when we take time to answer questions sent our way by readers like you. Have a question you want answered? Send an e-mail to getready@apha.org. Q: Where I live, people totally panic when it snows. This year, I want to get a jump on things. What should I do to get ready for winter storms? A: If you’re on the East Coast of the United States, then it may be a little late for that jump, given our recent storms. But there’s plenty you can do to make sure you’re ready for the next squall. Winter has only just begun, so take a few minutes now to take stock of your storm preparedness. Many of these steps can be done well before storms turn up in the forecast. First, advises the Centers for Disease Control and Prevention, make sure your home is prepared. That means insulating water lines that run along outside walls and having your chimney inspected to make sure it’s operational if you plan to use it. Next, prepare your car. Make sure fluids and gas are topped off and tires have enough air. If you find yourself driving in a storm — which, of course, is not advised — it’s a good idea to keep lots of gas in the tank, just in case the roads become treacherous and you need to stop for a while. Once a storm is on the way, you’ll want to make sure you have the necessary supplies in case you can’t leave home for a few days. That means having plenty of food — include some that can be eaten without cooking in case the power goes out — as well as water. Experts recommend storing at least one gallon of water per person per day. Try shopping for these items well in advance of a storm, so you’re not left prowling the grocery store aisles as the clouds bear down. You’ll also want to have flashlights, batteries and a radio. A battery-operated cell phone charger is also a plus. Finally, once the storm clears, don’t try to clear all the snow at once. Shovel in small amounts and stay warm! 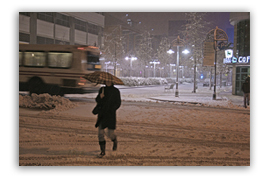 For more information and tips on winter storm preparation, check out our Get Ready fact sheet on winter storms (PDF). Approx 40 % of health care workers don't get the flu shot. This is especially dangerous to at-risk patients.